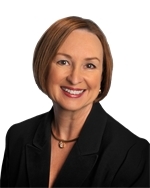 Rebecca Shahan Keller Williams Realty offers waterfront homes throughout the beautiful Lake Travis area. Click here to learn more! Lake Travis is a man-made reservoir that was formed in 1942 to contain floodwaters in a region originally prone to flash-floods. 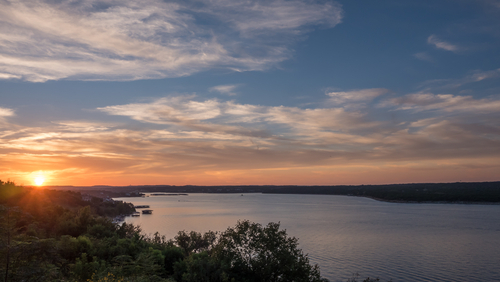 Today, Lake Travis is a bustling resort and recreational community. It has become one of the most desirable lakes in the region for outdoor recreation. People come from all over to enjoy boating, scuba diving, picnicking, swimming, zip lining and camping. The lake is also stocked with a variety of fish for recreational fishing, which include largemouth bass, white bass, guadalupe bass, striped bass, sunfish and catfish. 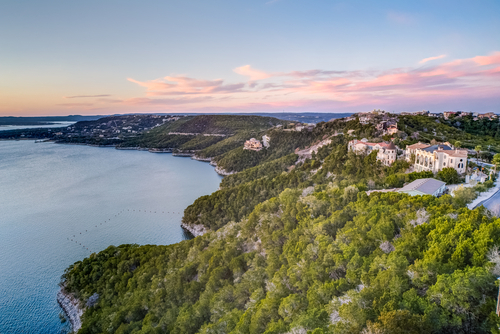 Being a resort community, residents of Lake Travis have a wide range of shopping and dining options. The Hill Country Galleria is a shopping center that blends natural beauty with a varied mix of shopping, dining and entertainment. The Shops at The Galleria features a variety of national brand stores and regional favorites set in open courtyards and fountains ponds. There is also a great variety of specialty stores such as The Treasury, Faraday’s Kitchen Store, Harrison Jewelers, and Magpie Blossom Voutique, to name a few. Of course, there’s a fantastic assortment of great places to eat near Lake Travis. Oasis on Lake Travis, located on cliff 450 ft above Lake Travis, is considered the largest outdoor restaurant in Texas and offers extraordinary views of the lake from its dining decks and has been called the Sunset Capital of Texas. Then there’s Briarcliff Bistro & Bacon Bar, a bacon lovers paradise with the motto “When the Universe hands you a pig, you make BACON!”. And if you’re in the mood for amazing pizza, then Tony C’s Coal Fired Pizza is the place to go for the best New York style pizza and Italian food near the lake. When it comes to what you can do for fun on and around Lake Travis, the real question is what can’t you do for fun? In addition to all the activities you can do on the lake, there are plenty of recreational opportunities around Lake Travis. Lake Travis Zipline Adventures offers the longest zipline in Texas at over 2800 feet over the lake. Professional tour guides also take you on educational hikes and nature walks. Or if you’re in the mood for a round of golf, there’s the Avery Ranch Golf Club. For the ideal wine-tasting experience, Stone House Vineyard offers the perfect setting, overlooking Lake Travis surrounded by 7 acres of vinyards. Or if you want to explore the lake from above, then take a helicopter tour with HELO Austin. Students living in the Lake Travis area attend schools in the Lake Travis Independent School District. Communities that are served by this district include Briarcliff, Lakeway, Bee Cave, and The Hills. There are 9 schools in the district, which include Lake Travis High School, Hudson Bend Middle School, Lake Pointe Elementary School, and Serene Hills Elementary School, among others.